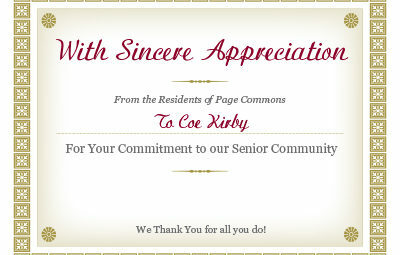 We are consistently delighted by the many different talents that volunteers bring to Mercy Housing communities. 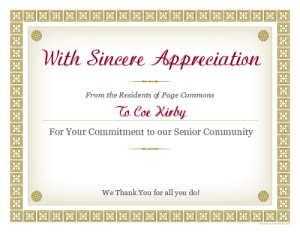 Coe Kirby, for instance, uses his special expertise as a certified senior trainer to help residents living at Page Commons in Phoenix, Arizona. For more than a year, Coe has been coming to Page Commons to lead group exercises designed specifically for the senior residents; as the owner of Miracles of Phoenix Fitness gym, Coe has a lot of experience helping people reach their health and wellness goals. 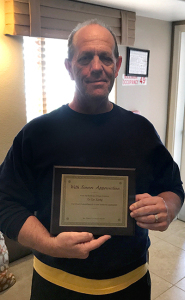 We recently honored Coe for his service with a plaque thanking him for all that he has done. If you are interested in volunteering, please send Mercy Housing an email with “Volunteer” in the subject line to info@mercyhousing.org. In the body of the email, please let us know in what city and state you would like to volunteer.